Life on the playa is different from life at home. You spend more time walking and biking and much, much less time sitting around. There’s no TV to watch (unless you bring a satellite hookup – but why would you do that? ), and there’s a lot of distance between sites. It’s especially important for those of us a aged 50, 60 or older to be prepared for a more physical week then you might normally spend. Of course, this article will not be relevant if you’re already a tri-athlete or riding 50 miles a day on your bike. But for most of us, getting ready is a good idea. I like to start with more biking or at least riding a stationary bike – every day if possible. You can easily ride 10 or more miles a day while on the playa, so don’t skimp on your preparations. Take a walk or two everyday, and go for some distance. I personally expand my dog walking distance prior to Burning Man (and because I have four dogs, I take them in two waves giving me extra walking time). 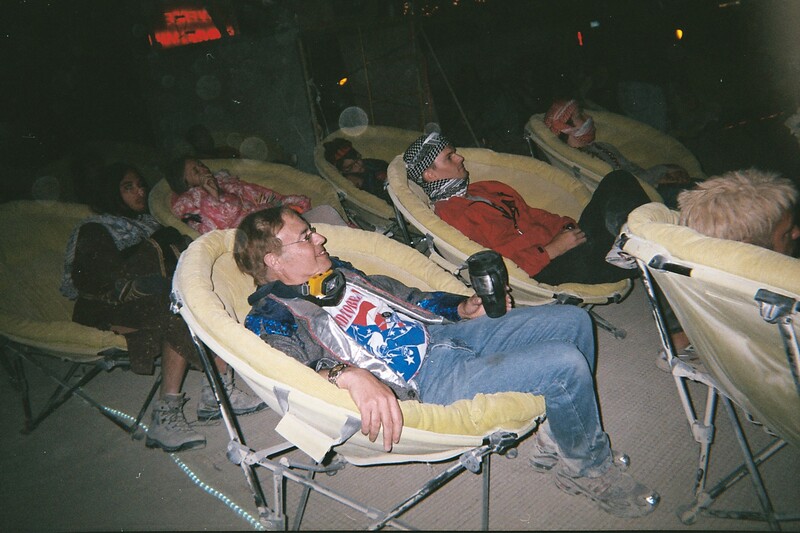 Chillin' at Center Camp: a way to relax, conserve energy and still enjoy the burn. While you’re outside, let yourself get adjusted to warmth and bright sunshine. Don’t forget sunscreen, a hat and plenty of water. It’s good to get in the habit of staying hydrated so you won’t forget to do so during the Burn. Dehydration is one of the top medical problems people encounter at Black Rock City. Don’t let it happen to you. Work on staying limber as well. You can never tell when you might get challenged to a fight a Thunderdome and need all your flexibility and more. Some things you simply can’t prepare for, like dust storms (you could have a friend, spouse, etc. throw sand in your face and test your goggles and face mask that way, but I don’t recommend it). You could also get in practice for the porta potties by stopping frequently to use gas station rest rooms, but, again, this is an optional exercise. There may actually be nothing you can do to prepare for the Burn’s (usually) well-managed system of porta-potties. In case you don’t already do it, start taking a mid-day nap and extending your nights a little later than usual. Finally, get your body used to a skosh more alcohol than usual. There’s a lot of dinking at Burning Man and you won’t want to suffer because of it. We may be a bit older than the average Burner, but there’s no reason we can’t enjoy it just as much as everyone else. As many of us learned in the scouts, Be Prepared! This entry was posted in Uncategorized and tagged Burning Man by sunr8563. Bookmark the permalink.